And, it isn’t Easter without Kinder Surprise! Easter is another great holiday where your family can get together, have fun, enjoy each other and share a delicious meal. Well, Easter at our house means that the girls are set up with an annual Easter Egg Hunt where they explore our entire house, inside and out , to find their goodies. Of course, each year, this hunt contains Kinder Egg Surprise! This year is no different, we are hoping for some milder weather so that we can take it outdoors. What we normally do is sneak outside bright and early to scatter the eggs. The eggs are filled with their favorite candies, change, stickers, stamps and Kinder Eggs and Kinder Bunnies, all before they wake up. By the time they are up and running, the Easter Bunny has come and gone and the eggs are awaiting the hunt. We always have a nice brunch on Easter, whether we have pancakes, eggs, bacon, french toast and the works or if we make a more traditional meal like chicken or ham with the fixins–we do it as a family! Things To Do on Easter! Need Some Easter Fun Ideas? Paint your eggs before the hunt, this can keep them busy for a long time! 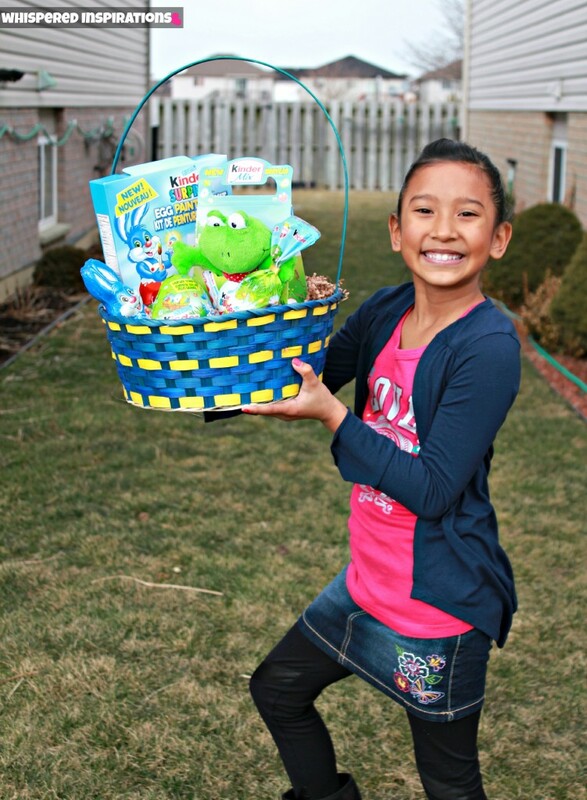 Organize an egg hunt, either in your backyard or at a local park. Cook up a feast and get the kids involved, they love to help! If you don’t want to cook a big brunch or dinner, head out into your city. There are plenty of restaurants that have special menus! Be sure to book ahead. Go onto Kinder Canada on FB and find out where Harry the Kinder Bunny will be, visit with him for FREE Kinder Mini Eggs! Get dressed up in your finest Sunday suits and get dolled up, just for fun. Have a tea party, along with sandwiches, steamed milk and Kinder Mini Eggs! Get outdoors! Go hiking and explore trails that you haven’t been to yet. Not outdoorsy? Stay in and have a movie marathon with popcorn and snacks! Pajamas are a must! Do crafts. Paint a portrait of the Easter Bunny himself or prepare carrots to leave for the Bunny! Perform some egg-periments and get creative with some science! Dust off your mic and have a karaoke spree with the whole family! If pampering is your thing, you can always do mani/pedis at home or even Mommy and Me facials. Find a recipe for one, here. After the hunt, you can share a Kinder Egg Surprise with your kiddies and help them build and play with the wonderful surprises within. The Magic of Kinder and Easter! 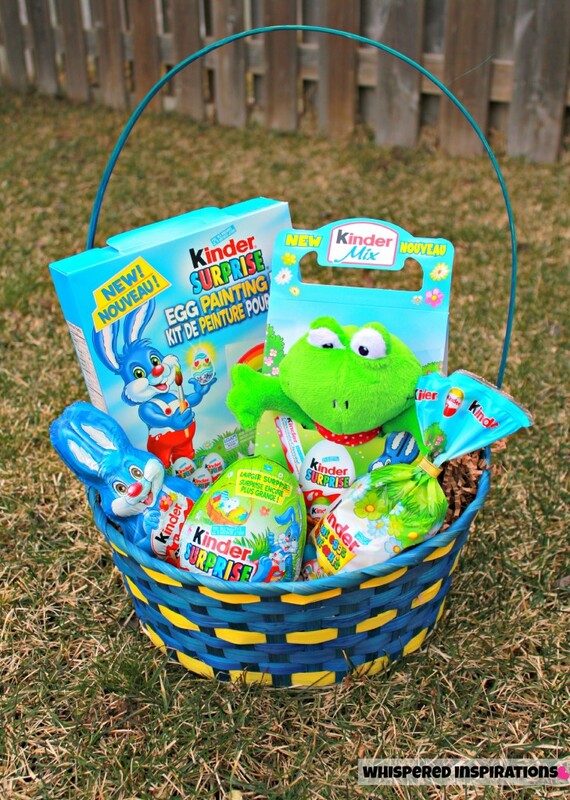 There are plenty of ways to treat yourself and help others with the magic that is Easter and with the help of Kinder Canada. Kinder sent over some of their magic in this amazing basket, my girls were over the moon and couldn’t be happier with the Kinder Bunny, Harry’s, delivery! 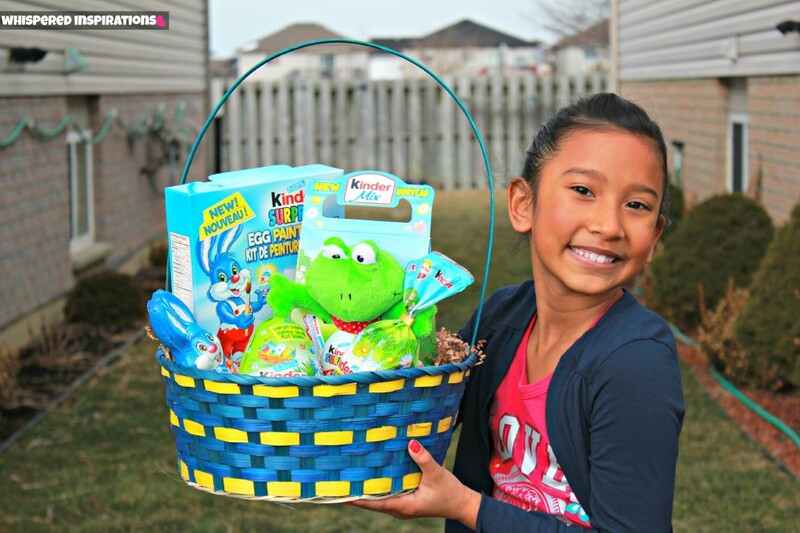 You can see Kinder Canada’s Easter gallery and discover 10 BIGGER toys found in the Easter goodies! You can see the Easter deliciousness, here. Help Kids and Bring Your Friends! Help the Children’s Miracle Network because sharing is caring. This is what the celebration is all about for KINDER® Canada, who will be donating $1 to Children’s Miracle Network of Canada for every new friend of their Facebook Page from March 1st to 31st, up to $25,000. Yet another reason to tell all of your friends to “LIKE” Kinder Canada for a great cause… bringing joy to children across Canada! Kinder Canada’s beloved Easter bunny Harry is touring Canada! Keep your eyes peeled, Harry will be making surprise appearances at family events in Toronto, Montreal, Calgary & Vancouver this March to celebrate Easter and spread the joy with FREE samples of Kinder® Mini eggs. Stay up to date on where Harry will be by checking the Kinder® Canada Facebook page! So, there are so many things you can do to have fun, enjoy treats and get involved this Easter! What are your family traditions on Easter? Note: I’m part of the Kinder® Mom program and I receive special perks as part of my affiliation with this group. The opinions on this blog are my own and have not been influenced in any way. Please see Whispered Inspirations‘ terms. We do gifts, and have an easter egg hunt with the kids at home before going to dinner at the inlaws and my parents. We do an Easter Egg hunt with the grandchildren of our neighbours (their mom and i hide the eggs, normally on the Saturday) and then Sunday morning the easter bunny has left a small hunt for the kids in our home with a basket of goodies. Am I crazy that I notice that you have no snow on the ground right now? Your daughter is beautiful and that basket of chocolate goodies looks great! I'm in Niagra Falls today at an indoor waterpark, and I can see snow blowing outside the window. My recent post The Croods Family Movie Review! Great tips! We love having outdoor hunts they are the best… its so early this year, lets cross our fingers the sun shines! Love your Easter idea's! 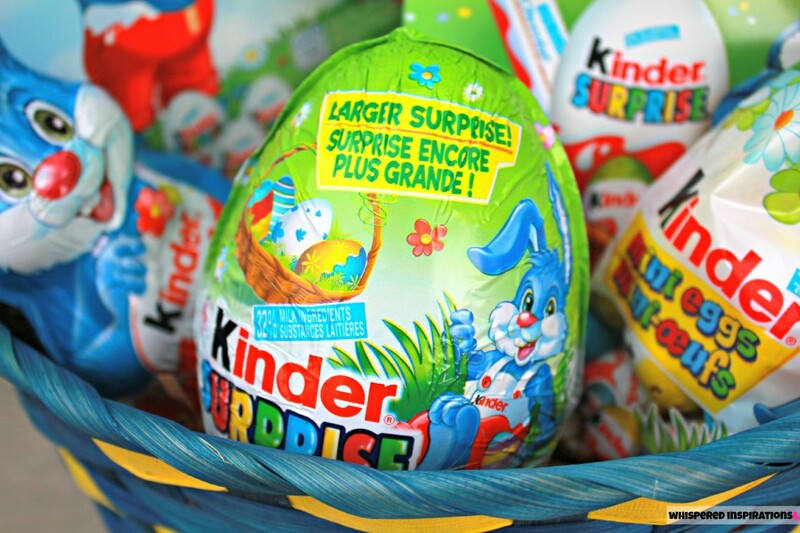 We're huge fans of Kinder. Great post! Yes, where is your snow? We got more today also. Boo. I am a big fan of Kinder because of the good they do giving back to community through Children's Miracle Network. Their stuffies are so cute too. I can't wait to see what that giant toy is inside my daughter's Easter Kinder egg.